www.islandstats.com brought you daily coverage of the 12 swimmers from the Warwick Academy High Performance Swim team attended the Speedo Winter Championships 2018 in Plantation Florida. 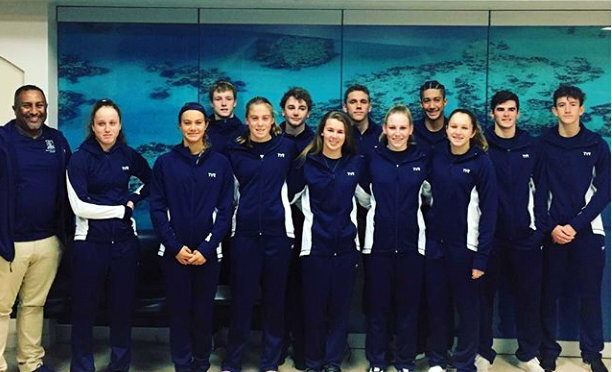 “The Speedo Winter Championships is a high level age group competition that attracts many of the best young swimmers in Florida and several from the Caribbean region,” continued Smith. All 12 swimmers had several Personal Best Times and many saw huge drops in time in several events. Some highlights of the results came with Taylor White winning Bronze Medal in the 13-14 Women’s 200 Yard Butterfly when she lowered her Personal Best from the morning by a further 4.5 seconds. Brian Desmond has continued his high level of performance with a Silver Medal in the 15-16 Men’s 500 Yard Freestyle Final and silver in the 15-16 Men’s 200 Yard Freestyle while dropping big chunks of time in both events and still having another year in the Age Group. Logan Watson-Brown had a great weekend of swimming with a Silver in the 15-16 Women’s 50 Yard Backstroke, Silver in the 15-16 Women’s 50 Yard Freestyle, Gold Medal in the 15-16 Women’s 100 Yard Freestyle and Gold in the 15-16 Women’s 100 Yard Backstroke. Watson-Brown’s results gave her a tie for second place in the Age Group High Point Champion. Also of note was Zebedee Wakeley hit his first Triple A time giving him half the qualification for Carifta and Caleb Ingham clocked his second Triple A time that makes him Qualified for Carifta.